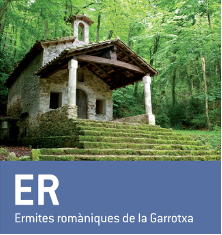 La Vall de Bianya in the north-west of La Garrotxa boasts an exceptional group of small Romanesque churches. Some of the most significant churches in this valley include Sant Andreu de Socarrats, Sant Martí de Capsec, Sant Martí de Solamal, Sant Martí del Clot, Sant Pere Despuig, Sant Salvador de Bianya, Santa Margarida de Bianya, Santa Maria de Castellar de la Muntanya, and Santa Maria de Llongarriu. It is worth visiting the Vall de Bianya Landscape Interpretation Centre in Sant Salvador de Bianya, which welcomes visitors to the municipality and offers services including an exhibition, the sale of local products, an audio-visual display and educational workshop.